I was curious about this book because I had read the River of Time series (definitely recommend), also by Lisa T. Bergren. I enjoyed Bergren's writing style in those books, and I liked in this book too in that sense. Yes, my of Season of Wonder is an e-book! Set in the distant future, Remnants: Season of Wonder is a dystopian/fantasy book geared towards young adults. The protagonist Adrianna is easy to relate to with her struggles and successes with her gift of empathy. I appreciated how the gifts of the Ailith were developed throughout the book, making it the strong point of the story. The descriptions of the setting and characters were minimal, however. While I appreciate settings that do not bog down a story, there were not many descriptions of the characters until half-way through the book when I already had a clear, quite different picture of the characters in my head. Although this book is more slow moving than other books, it does not fail to keep me guessing what will happen next. This book is set up to be a part of a trilogy, so it ends with a cliffhanger. This was frustrating because I wanted to know what happens, but this is also a good thing because I looked forward to the other books (I preordered book 2 before it came out). I also did not sense a clear climax of this book, for the tension at the end reflects the tension throughout the book and is not clearly escalated. I gave the book 4/5 stars for its strong message and characters but confusing plot elements and minimal descriptions. I would definitely recommend it to somebody who enjoy dystopian/fantasy literature and/or a good theme. 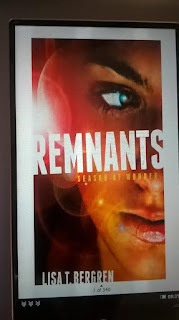 Season of Fire (The Remnants, book 2) picks up the story where Season of Wonder left off. You can read my review for it on Goodreads (I gave it 5/5 stars because I think the second book was better than the first). The final book, Season of Glory will release in the winter of 2016 (I can't wait!). If you enjoy these books, you should check out Bergren's River of Time series. Have any thoughts on this trilogy? Have you read any other YA fiction recently? I Can't Believe I Wrote THAT!